This year the Medieval Wine Faire in downtown Jefferson Texas begins with a “Harvest Moon Dance” on Friday night from 7:30 until 11:00 PM. Featuring the music of King Richard and The Bayou Boys. This sounds like a really fun addition; I’m expecting to see people dressed in their best medieval costuming including characters like Maid Marion, Robin Hood and maybe even Friar Tuck and some pretty maidens dancing up a storm. King Richard and the Bayou Boys. On Saturday from 11:00AM until 7:00PM the Royal Wine Courtyard under the tent you’ll find many Texas Wineries offering Wine Tastings. Grab your period gowns and britches dance to the music played by the bands on the stage. 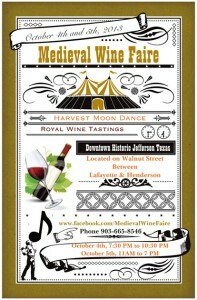 Up and down the street outside there will be vendors and craftsmen selling and sharing their wares. The vendors’ booths are open to the public. The list of bands and musicians is growing, here are just a few playing: King Richard and The Bayou Boys, Carmel and Nightwork Jazz, Loretta Cullens and Wes Hamilton. This entry was posted in Fall Events, Vineyard and Winery by Tammy D. Bookmark the permalink.